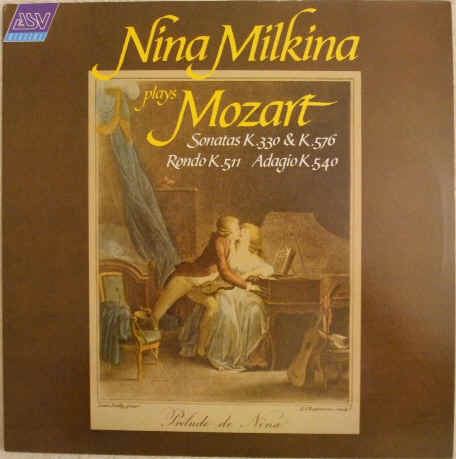 33rpm LP Record of DCA 648 NINA MILKINA PLAYS MOZART, Sonatas K 330 & K 576; Rondo K 511 and Adagio K 540, featuring Nina Milkina on piano. It was issued on the ASV Digital label in 1989. UK pressing. The record itself is graded better than excellent, with no discernible surface marks when viewed under normal house lighting. Superb sound quality, with NO jumps or crackle and only the odd very light tick (just to be critical). Otherwise just about faultless playback. The outer sleeve is graded excellent, with nothing more than the very lightest wear. The plain inner sleeve has no wear to speak of.